Action cams and smartphones; these are way we tend to record things today. Be it capturing a sky drive you did this morning, or just taking a picture of you and your friends on a night out, small and rugged cameras and phones are perfect. However, getting the best shot lined up can be tricky, so you need a mount or tripod that is flexible and light. We've found one... actually we've found several... from Joby in their Action Base Kit and GripTight GorillaPod Stand. These are two separate products from mount-maker Joby that work seamlessly together. First up, the Action Base Kit is a zip-close soft case with three different action cam mounts and tripods, as well as serving as a padded carry-all for your GoPro itself. Contained within it are three very useful Joby products: the GPod Mini Magnetic, the Action Hand Grip, and the GorillaPod Action Tripod. If you haven't heard about GorillaPod camera and phone accessories, they are basically very clever tripod systems which allow you to stand your camera in the conventional way, utilising all three legs, and also flex those spider-like legs around just about anything. You can grip a GorillaPod tripod to the handlebars of your bike, a tree, a lamppost, around you dog's collar, to a skateboard... anything. 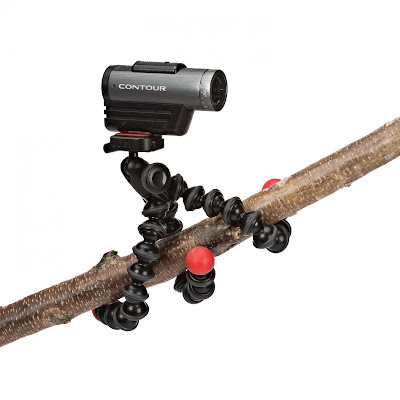 The GorillaPod Action Tripod, the largest accessory in the kit, then features a screw top joint to which action cams of all kinds can be fixed. The legs close tightly together keeping your camera in place, and thanks to the near-infinite flexibility you can set the cam at any angle you desire. The GPod Mini Magnetic is very similar to it's bigger brother in that it features three highly-articulated legs, but is much smaller, shorter, lighter, and... FEATURES MAGNETS AT THE ENDS OF THE FEET! This is extremely useful when you need to fix your action camera to a metal surface (the magnets are reassuringly stable) or indeed jut require a shorter-legged tripod. Finally in the Action Base Kit is the Action Hand Grip. This is a very simple but highly practical thing for using an action cam like a conventional camcorder. The cam screws onto the top in the usual way, then you hold the Hand Grip to get a clear no-fingers-over-the-lens shot. It also features a wrist tie making it perfect if you're holding your cam whilst surfing, skating, skiing, parachuting... whatever. Oh, and it floats which is a massive weight off the mind of fans of water-sports. The Action Hand Grip can also be used in conjunction with other Joby photography gadgets such as the Joby Pole. Available separately to the Action Base Kit (but can be fitted inside thanks to the kit's customisable interior padding) is the GripTight GorillaPod Stand. This is very similar in size to the GorillaPod Action Tripod but includes a removable GripTight clamp that can firmly hold onto smartphones. This means that your phone's camera can also be used to capture all the action, while being affixed somewhere safely thanks to the GorillaPod legs. This is the perfect addition to any action cam kit as, lets face it, the camera on your smartphone can be just as good as the one you're currently strapping to your helmet. You might not want to slide down the side of a mountain with your super-expensive phone attached to your skis, but setting up your phone on a tree to capture the action as you fly by is a great idea. All these photography accessories from Joby are really well made and exceptionally versatile. The fact that they've put together a carry case full of handy parts is a great idea; one that users of action cans – be they adventurers or not – really ought to check out.